Can you think outside the sandwich for a moment? If so, read on; we’ll get to sandwiches at the end. 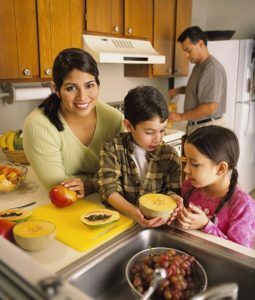 Although this is Part Two of Back-to-School Lunch Series, these tips are for everyone! See Part One Here. I’ve got a confession to make. When my kids were in elementary school, I burned them out on PB & J sandwiches. I think a peanut butter sandwich is the perfect go-to for lunch (or breakfast). You don’t have to keep it cold, it’s super healthy and it’s kind of a comfort food. But yes folks, there can be too much of a good thing! Don’t do what I did and instead mix up the menu for lunch! You can also mix it up–putting the protein, veggies, fruit and carbs all together. Visualize this: spinach salad with chicken & mango salad wrapped up in a whole grain tortilla. Then you need to pack something to drink. Meatless Monday: Bean burrito with grated cheese, avocado and cilantro. Try black beans for a change. 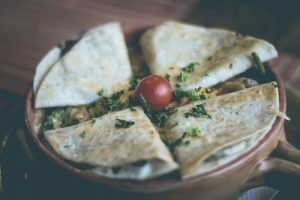 On the side–a container of salsa and fat-free sour cream or plain greek yogurt and some baked blue tortilla chips. (yep-salsa counts as a veggie!) For dessert: mango slices or peach fruit cup. Fishy Friday: Mix canned salmon (remove the skin) with light cream cheese, dill and garlic powder in the blender or food processor. Spread on: bread, crackers, celery, etc. On the side: cucumber slices with lime, fresh pear. Meatless Monday: Dippin’ Lunch: Hummus with whole grain pita triangles, celery, cucumber, bell pepper and carrot sticks for dipping. Dessert: melon balls. Wednesday: Chicken & rice salad: Using leftover chicken, and rice (you can also use leftover barley, quinoa or bulgar), add dried cranberries or raisins and chopped red pepper and julienne carrots. Add a little vinaigrette or Ranch. For dessert: Yogurt Banana pudding: thinly slice bananas and mix with vanilla Greek yogurt. Put a layer of granola in the bottom and top of container. What if you or kid still loves a good sandwich? No problem…just don’t forget to add the fruits and veggies to go with! 1. 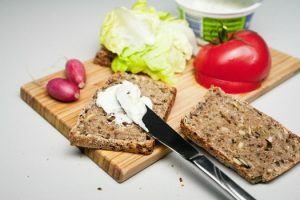 Make them into finger sandwiches, which are especially great for kids of all ages who don’t like the crust. 2. Cut them into cute shapes using a cookie cutter. 3. Use different colored bread: brown & white for example. 4. Use different kinds of bread: French bread, whole grain bread, raisin bread, Ciabatta, pita. There’s a bread that works well with every filling. 5. Add unexpected ingredients–think julienne carrots or grated jicama. I’ve even seen corn added to sandwiches! If you can get some fresh herbs, a little fresh parsley or basil adds a nice touch to sandwiches. My experience is, kids get dehydrated at school. A few sips from the water fountain just doesn’t cut it. So always send a mini water bottle plus a juice or milk box. (I like the milk boxes from Horizon or Organic Valley.) If your kids are allowed to carry a water bottle throughout the day, send a stainless steel or glass one like one of these in her backpack. There’s one in every size! 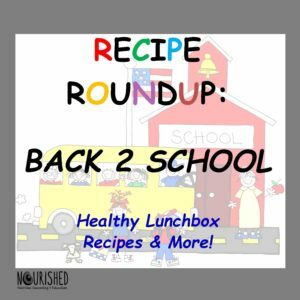 Great lunchbox recipes from Caitilin Perez RD and other RDs!